As you may know one of the staple items in our shop that we have always had great reaction to has been our floral/stripe mixed tops. We have been styling and selling these rayon jersey printed tops for couple of years now in different color and pattern combos and they are always a favorite. Today I have a brand new floral stripe top to show you guys which might look a little familiar to some of you. 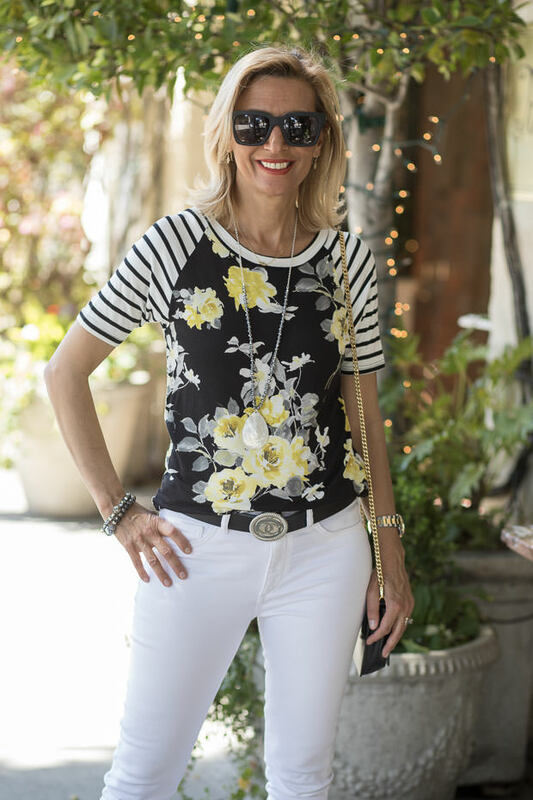 It is called our Black Ivory Yellow Short Sleeve Floral Stripe T-Shirt. In fact, we had this same floral print a couple of years ago, but the body was a little different. That one had a three-quarter length sleeve whereas this new one is short sleeve making it perfect for spring and summer. 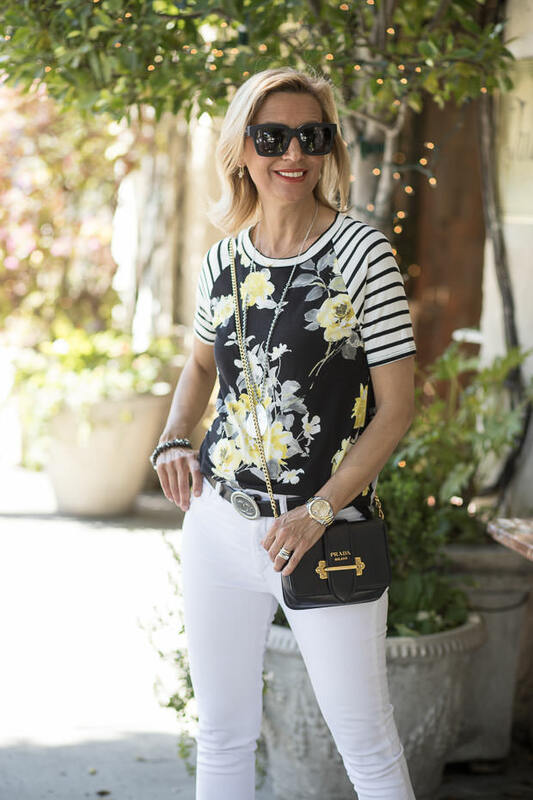 The body is made out of a beautiful floral pattern in black, ivory, gray and yellow color combo and the sleeve is made out of an ivory and black stripe. The fabric is a soft rayon jersey that is super easy to wear. The length is quite long and even though I have tucked it in, you can see the back length in the side view pictures below and you can also see the length in our shop photos. One more thing that is great about this top, is the fact that it has a little bit of yellow in the print. As I mentioned a couple of weeks ago, yellow is a big trend color for this spring and summer. If you don’t like wearing a lot of yellow, this is a great way to introduce the trendy color without going all out with it. I am wearing this top with my white skinny jeans which I think looks really nice, but it would also look just as good with a black or even denim bottom. I added our Black Shawl Collar Open Front Blazer which is a great classic blazer that you can throw on with so many outfits. The body is semi shaped and has an open-front look, making it casual enough to wear with jeans or you can dress it up to wear to work during the week. As for jewelry I added our Silver Chain Necklace with Silver Pendant and Beads and Set of Two Iridescent Gray Bead Bracelets. Silver based jewelry looks really nice with this top, even though gold would work just as well because of the yellow flowers. The necklace is sister to our best-selling Gold Chain Necklace with Gold Pendant which we have restocked a few times and you can see that one here. I think the gold one would work nicely with the top as well, if you prefer gold over silver. As for the bracelet set, I wanted you to know we only have two sets left of these beautiful bracelets. If you like them, grab them now before they sell out. So pretty! I just love how in the photo where you’re wearing the blazer, it really makes the yellow flowers pop. I need to get my white denim back out SOON. Wow, those white jeans look great on you Nora! Love the raw hem! 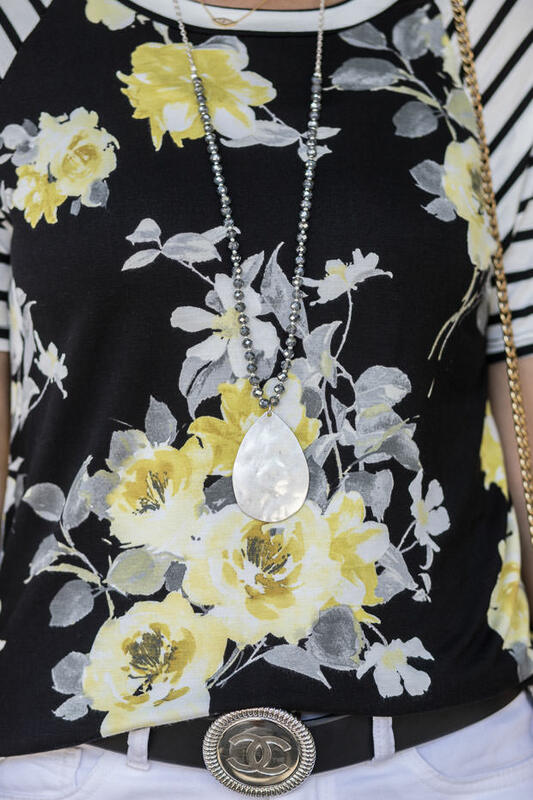 The yellow flowers in your top really stand out against the black and white. Lovely!